Aaron Finch. Picture: Scott Merrylees. THE Ashes is less than a month away and Aaron Finch is predicting a hard-fought series. Not for him the crowing certainty of a 5-0 win for Australia, or a result of similarly one-sided proportions. 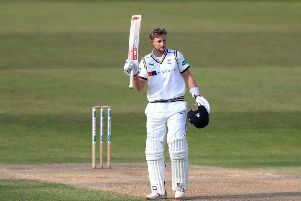 Finch, who has played 49 one-day internationals and 22 T20 internationals for the Baggy Green, diplomatically described England as “a quality side”. He feels it could be a cracker of a contest. “It’s obviously going to be a huge series, and England have played some good cricket in the last couple of Tests,” said Finch. “Australia have played some good cricket against the West Indies, so I think both teams will go into the Ashes very confident and both with pretty ideal preparation. Finch is backing fellow Australian Trevor Bayliss to do well after he was appointed as England coach in place of Peter Moores. Finch worked with Bayliss last year when he temporarily took charge of the Australia T20 side that Finch captains. “Trevor is someone who’s had a lot of success as a coach wherever he’s coached,” said Finch. “I’m sure that he’ll bring a lot of enthusiasm and a lot of aggressive cricket to the England team. Bayliss pipped Yorkshire coach Jason Gillespie to the England job, and now Gillespie is keen to get some one-day silverware on his CV. His side go into Sunday’s T20 game against Northants having won two and lost two in the 14-match group stage. “I think we’ve done some very good things so far, but our bowling in the first six overs and our bowling at the death has been an issue,” said Gillespie. Yorkshire (from): Bairstow, Ballance, Bresnan, Brooks, Finch, Gale (captain), Gibson, Leaning, Lees, Maxwell, Middlebrook, Patterson, Pyrah, Rhodes.